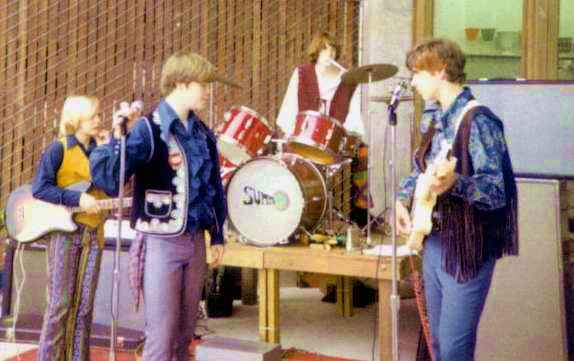 My first band was called “The Sunn”. 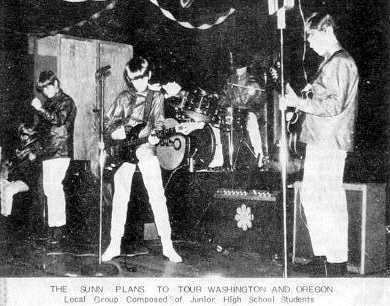 We put it together for a 6th grade talent show in Kirkland, Washington in December 1967. 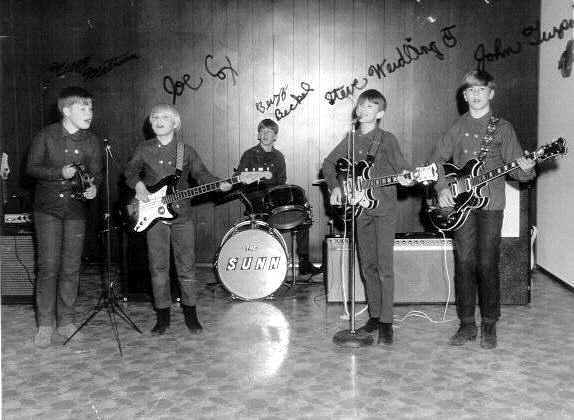 The original members were Buzz Beckel on drums, Steve Weidling on guitar, me (Joe Cox) on bass, Kregg Mattson on vocals and John Turpin on guitar. Buzz’s mom, a very kind and generous woman named Louise Beckel, loved us and became our manager. She drove us to practices and gigs; she even got us a PA and van. Our first three songs were, “I’m Not Your Steppin’ Stone“, “Gimmie Some Lovin” and “Last Time”. We played at private parties, church dances, roller rinks and school dances. 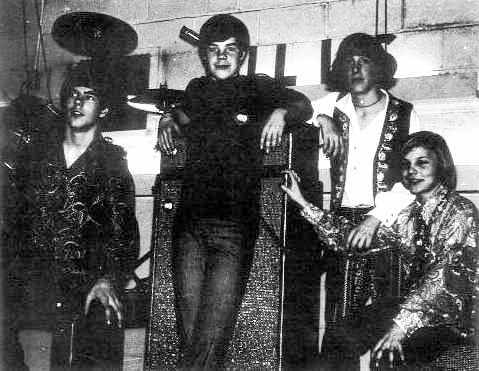 Our career highlights were, being the youngest band at the Seattle teen fair talent show at the Seattle Center Coliseum in 1968, playing for the roller skaters, Friday nights at Lake Hills Roller Rink in Bellevue, Washington, a New Year’s Eve (1970-71) concert at the Cinemond Theater in Redmond, Washington and playing at our own schools, Kirkland Junior High and Rose Hill Junior High. Steve Weidling was an excellent guitar player and singer, a natural. He left the band in 1969 and never pursued a music career. The band continued on as a 4 piece. Buzz Beckel was also a natural musician, he played piano, guitar, drums and sang well, his father, Fred Beckel had played sax in the big band era. Buzz played in bands through the 70’s and later became a filmmaker. John Turpin was very talented. Besides being an excellent musician he was also a great athlete. He moved to Alabama in high school and played football for Bear Bryant at the University of Alabama. He now owns a design business in the Los Angeles area. 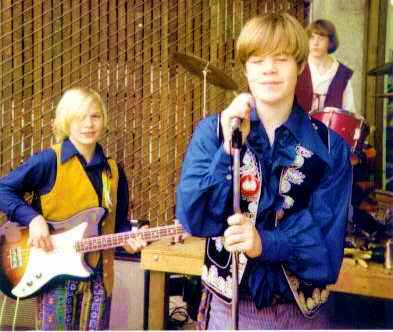 Kregg Mattson was also a natural musician, even in junior high he always sang on key. He played keys, guitar, drums and bass. Kregg is still a working musician and a close friend. Today he has a single act and a duo and performs from Arizona to Washington, mostly in private clubs. Buzz’s family came to the Seattle area because Fred Beckel was working on the Boeing SST project. When that project was canceled they moved back to Pennsylvania. The band broke up in June of 1971. By then we were playing songs by Santana, Buddy Miles, Jimi Hendrix, Grand Funk Railroad, Chicago, The Stones and the Beatles. I learned how to play the bass with “The Sunn” and I’m grateful for all of the fun and friendship we had. My obsession with the bass has never left me. I still play live gigs, write songs and practice my bass everyday. A local group THE SUNN, was featured during the Second Annual KJR night at the Tiffany Skate Inn, Kent, on Feb. 18. Disc jockeys Tom Murphy, Buzz Barr and Bwana Johnny entered in the festivities. THE SUNN’S spectacular performance prompted a return engagement at Tiffany’s the following Friday night. Members of the group, all Kirkland area residents, are STEVE WEIDLING 12. BUZZ BECKEL. 12, JOE COX 13, JOHN TURPIN 13, and KREGG MATTSON 13, who are in the seventh grade at Kirkland Junior High and Redmond Junior High. A successful past year includes appearances at the Coliseum and on television. During this summer they expect to go on tour throughout Washington and Oregon. Jan Burmeister, Pat Shepard, East Side Journal, Feb 26, 1969.